Long, very long ago, in another galaxy further north on the US west coast, the Death Star Microsoft was not playing the standardization game and was submitting proposals to W3C the day it was shipping to the masses a browser implementing that proposal. Or ship without any proposal. These days are over, and Microsoft finally embraced Web Standards and all rejoiced. Yesterday, further south on the US west coast, the "All Your Documents Are Belong To Us" Mothership Apple started showing incompatible authoring environments and rendering engines based on proprietary extensions to html and CSS that will hit the wild. Yesterday, Apple released iBooks Author and I am not afraid to say that despite of being a great authoring tool, the solution it offers is a step backwards and it's not good news for users/customers. I have downloaded iBooks Author (IBA) and played with it. I have in particular looked at the two formats it outputs, the iba format and the ibooks format. "tout livre ou tout autre travail réalisé à l’aide de ce logiciel (« travail »), ne peut être vendu ou distribué uniquement via Apple (par exemple sur l’iBookstore) et une telle distribution est sujette à un accord séparé conclu avec Apple"
Let's go back to the formats now. The first IBA format, the iba format, is, as always with Apple, a zip archive pretending to be a single file. The iba file I created from my little demo was contained in a single XML file. Totally unreadable, based on proprietary Apple xml namespaces (sl, sf and sfa, all in http://developer.apple.com/namespaces/ space). It's not readable in a regular browser because browsers have no knowledge of those namespaces. It's completely closed, useless outside of the Apple world. Nothing more to say here. it uses a proprietary extension of CSS Media Queries, adding the keywords paginated and nonpaginated. Unprefixed. Not even -ibooks-paginated... Since this is not part of the official CSS Media Queries specification, this is not conformant EPUB3. As far as I know, this extension to the list of CSS media was only recently mentioned once during a chat but never seriously discussed or even proposed as a written proposal. it applies stylesheets to the html5 (xml serialization) documents through xml-stylesheet processing instructions. That's perfectly fine since it's an xml serialization but that's not the common way of linking stylesheets in the html world. A minor issue but still. it contains a weird <link rel="stylesheet" type="text/xml+svg" href="assets/svg/content1.svg" /> where the target is really a SVG document. The behaviour of this link element is undefined from a standards' point of view. Conceptually, this is plain wrong. A SVG document instance is not a stylesheet. It could be used by a stylesheet to define exclusion paths for instance but it cannot be called a stylesheet. again, a definition for a proprietary namespace @namespace ibooks "http://www.apple.com/2011/iBooks". The format clearly extends HTML5 and we have just no idea how. something equivalent to Adobe's Regions and Exclusions. Extended underlining is based on an old draft of CSS 3 Text and some of these proposed properties were dropped by the CSS WG after discussion in www-style. The ability to control the size of each column and column gap was recently discussed in the CSS WG. The Group decided that allowing setting of individual column width and column gap width is not a feature considered for the first REC of this document. So Apple is here extending the CSS Multi-Column Layout Module and never told us about it. It is a system vaguely similar to - but still different from - what Adobe proposed with CSS 3 Exclusions and Adobe's proposal is the document the whole CSS WG is working on. Because of these extensions, editing or browsing the html documents with a regular wysiwyg editor (BlueGriffon or DreamWeaver for instance) or a browser (Firefox, Chrome or even Safari) shows a total mess on screen. It's not readable, it's not usable, it's not editable. Just forget it, Apple (re-)invented the Web totally incompatible with the Web. first, the english EULA of iBooks Author is just unacceptable. When I buy a computer, what I do with it is mine. When I buy a workbench, wood and a drill, what I do with them is mine. And when I buy or get a software license, what I do with it is mine and if I want to sell it through rabbits carrying CDs, that's my freedom. So if you're a publisher or a book author willing to use IBA, make sure your Legal Department carefully studies the IBA EULA. second, IBA is not EPUB3. A wysiwyg EPUB3 editor will not be able to edit correctly an IBA document because of the different mimetype and the proprietary CSS extensions. iBooks Author is not able to reopen a iBook it exported in their pseudo-EPUB3 format because there is no Import mechanism! That means that on one hand EPUB3 readers cannot reuse a document created by iBooks Author because of its HTML/CSS/Namespaces extensions, and on the other iBooks Author cannot create an iBook from an existing EPUB3 document because it cannot import it. 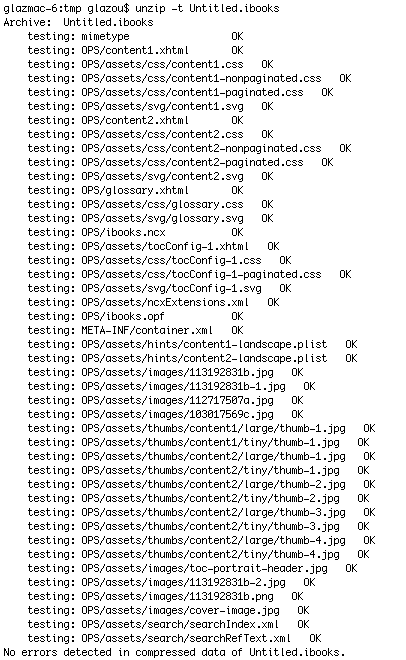 But wait, can we open an EPUB3 or a regular HTML document into another app and copy/paste the content inside IBA? I tried from an HTML instance in Safari and from an EPUB reader based on Safari. It does not work, all markup is lost, it pastes text. Ugly result. Oh, and changing file extensions from ibooks to epub or vice-versa does not help either. For the time being, iBooks on my iPad is anemic. Two days ago, I wanted to find a book by Asimov. Unavailable in french on the iBooks Store. Not a single Asimov... Wow. So I started browsing the Store to find things I could read on the iPad during my next trip. I discovered the iBooks Store is so tiny it just does not stand a single second the comparison with Amazon or even EPUB3-based bookstores. Reading a book on my iPad is cool. I just can't find in Apple's bookstore the books I want - and I am not looking for rare or hyper-intellectual stuff - so paper-based books are still my best choice. With iBooks Author, Apple is trying even more to lock their formats and the market. But this is a bad strategy because publishers are fed up with formats. For one book, they have too many formats to export to. For each format, they have to use tools to convert (usually from MS Word) that are incomplete and all require manual reformatting or validation. Adding an extra format that is almost EPUB3 but is definitely not EPUB3 output by a software that is an isolated island and does not offer any extra help to reduce the publishing burden is representing a huge extra investment and is then, in my opinion, a mistake. Apple has played here the game Microsoft was playing back in 1996/1997. Implementing behind the curtains up to that point, extending standards but not disclosing the extensions, using unstabilized Working Drafts into shipped products, making the shipped solution incompatible with the rest of the market and even incompatible with the other rendering engines of Apple, is a strategic error. It can only lead to a mess reaching the magnitude of the Outlook mess when it switched rendering engines and created a gigantic chaos for corporations sending newsletters that the recipients could not read any more. format incompatiblity is extremely expensive here, meaning it's impossible to use IBA as the pivot editor for creation. It's also impossible to use another tool to create an EPUB3 and only import it into IBA to enrich it since IBA has no Import feature. It's even impossible to browse a HTML document with Safari and copy/paste content into the HTML document handled by IBA!!! Pure crazyness. When a piece of software is so well designed from a UI point of view and could become such an attractor in terms of usage, I feel this is a totally wrong strategy. Opening up everything and using only carefully chosen standards and matching the version of WebKit used by Safari would have given an immense and almost unbeatable competitive advantage to Apple, would have attracted even more people to the Mac platform and would have turned the iBooks Store into the primary online choice of publication for all new books. Starting with full conformance with EPUB3 and pushing for a fast update of EPUB3 or release of EPUB4 including all new CSS cool kids was a much better, and much more secure way of doing things. That's like having a new hyper-cool appliance with a US power socket and traveling to Europe without adapter, and no possibility to buy such an adapter there. It's still a hyper-cool appliance but it will remain in the bag. @Jason: d'oh thanks the heads up Jason. Hi Daniel, thanks for this informative write-up! Based on what I have seen so far in unzipped iBooks - lack of Navigation Content Document (old NCX is used instead) + some other technical details - I think that Apple's proprietary iBooks format is actually a mashup of EPUB 2 with HTML5 features thrown-in "for free" (WebKit). The buzz about Apple supporting EPUB3 is slightly exaggerated, in my opinion. For sure, they implement some cool innovative stuff (i.e. not just in their reader's user interface, but also in the format itself), however they have been doing so for a long time with EPUB2, by allowing authors to use modern HTML5 features in their e-books. One EPUB3 feature that they deserve credit for implementing is EPUB3 Media Overlays (synchronized text/audio talking books). Thanks for the detailed breakdown. I must admit, I'm baffled by Apple's insistence on copying Microsoft's playbook, even though it only brought them antitrust pain and did little in the end to prevent their dominance being disrupted when the internet came along. Do Apple execs really think, "Well, the USA, EU and China won't let other companies use anti-competitive measures to establish a monopoly, but _we'll_ get away with it for sure." Why risk the future of their company like that? Merci pour l'analyse du code. Ça m'est très utile. Entièrement d'accord avec la conclusion. Je suis même très déçu de cette occasion ratée. Nice write up but I'm stumped as to why you, and so many others, are surprised that Apple delivered a high level tool to support Apple? They are not Adobe, making generic authoring tools. They did not ship "iBooks/Android/EPUB3 Author". If one wants to create and ship a generic EPUB book, there are plenty of other ways to do that. iOS development tools (i.e., XCode) doesn't compile Android apps. iTunes wasn't created to manage music for all MP3 players on the market. Their tools support their hardware...just like Amazon's "near-forking" of Android does to position Fire as a front-end to their store (and I don't hear any cries that people can't buy from the iBooks store on their Kindles or Kindle Fire). So to suggest Apple is somehow subverting standards is ludicrous. One can still opt for generic EPUB tools and publish everywhere...including the iBooks store. Steve: There's a big difference IMO between developing an entirely proprietary platform like iOS and having tools which produce software for it, and taking an existing, open standard for content like EPUB, adding a few proprietary extensions, and using it to people lock-in into a single platform and marketplace. That kind of embrace-and-extend strategy is the definition of standards abuse. code to you. Only way Apple will comply is if US Government forces a standard and Schools adopt it. 1. It is a disappointment that an "interactive book" can only be viewed by iBooks 2. I was hoping that an iPad app would be another output format (HTML, PDF, iBook). Alas, any interactive book I create will get mixed into all the other books within my iBooks app. At least I can use Collections to make "folders" within iBooks as a way to separate the various books. 2. Standards. When Apple first came out with Safari, they had taken the Konquerer open-source software and went into hiding for many months. Yet they did come out and share their code in the form of WebKit. This might be the same approach. After months of secret work and now a product release, they might start working with the open standards groups to share their vision and technical suggestions. 3. If you want a tool that is usable on Mac and Windows and generates viewable output for many platforms, then go BUY an expensive subscription to Adobe's Digital Publisher System and also BUY the expensive Adobe InDesign tool. Contrast that with getting a cheap used (or a new) Mac and use the iBooks Author tool for content creation and the iBookstore for content distribution ... for FREE!!! There's a bit of a difference between what Microsoft did in the late ’90s with Internet Explorer and FrontPage and what Apple is doing today with iBooks and iBooks Author. Back in the late ’90s Microsoft gave the illusion of standard HTML, complete with the '.htm' extension but it wasn't until the result was viewed in other browsers that it became apparent that the result was proprietary and not standards compliant. Apple is making no similar claim here. 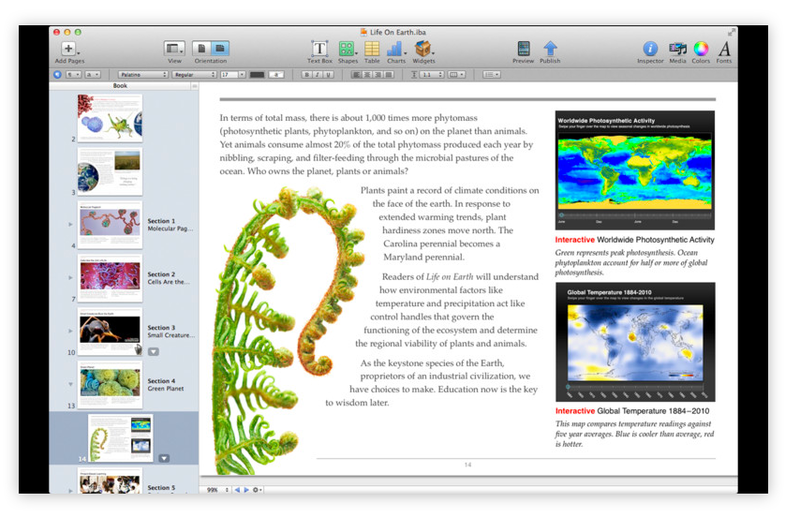 The iBooks format is proprietary and the output from iBooks Author is as well. They make no claim the what you produce with the authoring tool can be output and used everywhere in the interactive format and you know that going in. You can of course output to PDF but you loose the interactivity. So, you have a choice to make. You can stick with standards compliant ePub and any restrictions inherent in the format and publish everywhere, including the iBook Store or you create a version in Apple's format with all the bells and whistles knowing that it can only be read on Apple's iOS devices. Going the second route does not preclude you from repurposing your materials in other formats, including standards compliant ePub, or any of the other proprietary formats. I really hope Apple comes around and sees the light. There seems to be enough ePub 3 in the ibooks format that creating an option in Author to export to conformant ePub 3 would be a trivial addition. Such an addition would really help drive adoption of the new standard. Come on Apple, make us happy. @MacBoy it is obvious from even you sig line where you stand with regard to Apple products, and if you are happy with them, then I am happy for you. However, I for one will not be purchasing or even downloading *any* book in the iBook format because frankly I am invested in Android (for my tablet) and I don't mind admitting to using Windows (like 80% of the real world) - in part also because of what I do (web accessibility: with most Adaptive Technology written for the Windows platform). Your naive suggestion that Apple will somehow open up their new publishing format (in a fashion to what Adobe did with PDF) simply flies in the face of current events and Apple's long track record. As a manufacturer of devices that exclusively read the iBook format, what incentive is there for Apple to open that up to Google, Adobe or Microsoft (or HP, Amazon, RIM, etc., etc.) when doing so would simply erode their hardware sales? And look at their distribution model - only via iTunes store, and nowhere else? How do you think Amazon feels about that? Do you even think that the Kindle or Nook devices would want to support iBook, if they cannot get a piece of selling the content? It's the content after all that people want, devices for all but the hard-core Apple fans is secondary - again, look at the sale of Kindle devices this past Christmas. Nope, just another hard-core power-play by Apple. I vote to Blackout Apple iBook; I'm voting with my feet, and I hope others will as well. Say no to closed, proprietary formats. Sorry but it's called iBooks Author and not ePub Author for a reason: it is meant to make iBooks not ePub files. As you say, they are not ePub files. It is a proprietary format and this means that they can do whatever they want with it, adding new CSS properties and whatnot. If they had stated that they are ePub files anywhere then they would have an obligation to make them valid, but they did not, and their custom mimetype shows that this was not their goal. Yeah maybe they based their format on a few web technologies, but that doesn't mean you have to complain when it doesn't work in an unsupported reader - they just weren't designed for that. And if they had made it a valid ePub editor, they wouldn't have been able to do some of the custom stuff that they wanted to make possible in their editor on all readers so they basically *had* to make a custom proprietary format. Perhaps they will submit some of their changes to standards bodies but I wouldn't count on it. What's next, are you going to claim, Mr Glazman, that mobi format is trying to be eBooks too? Apple has used ePub format and has this "openness" of the format made it a market leader? OF COURSE NOT! Openness of file formats have nothing to do with user experience. I think we've seen that with MSDoc and ODF. This app is meant for iBooks, not for eBooks. Its name should give you a clue as to what it does. "first, the english EULA of iBooks Author is just unacceptable. When I buy a computer"
Last time I checked, iBooks Author is FREE and you don't have to PAY for it. You can also distribute and make FREE books with it. But if you want to sell them through Google's parasite bookstore, you can't. Amazon too makes free tools to make Kindle compatible mobi books. What other platform supports those? How has this closed format hurt them? IT HASN'T! Why should apple wait for W3C to release its spec when we've all seen how incompetent W3C has been so far and how WHATWG saved your assess when W3C was stuck in XML nonsense. This post further shows how pointless and useless W3C has become. I am confused. You seem to imply that Apple is claiming its iba format is compatible with epub. I have found no such claim. OTOH: I have found several rumor sites over the last few weeks asserting that Apple was about to release an epub creation and editing tool. However, Apple did no such thing. One can argue if strategically that's a better move for Apple or not, and that is an interesting question that only time will tell. But, in this case, I don't think anyone can accuse Apple of being misleading, their tool is not epub compatible nor did they say it was. In contrast to Microsoft, I suspect the current iBooks format has less to do with a long-term strategy of "embrace, extend, extinguish" by Apple than it does with a short-term strategy of "deliver a complete textbook publishing and delivery system today", because, _today_, nobody else is doing this. I'm not sure what any of this has to do with Outlook, given that Apple encourages HTML5 compliance outside documents that are designed and licensed exclusively for use in iBooks. The goal seems to be to establish the iPad as a standard in education, not the iBooks format, and one thing Apple has to contend with is adoption committees who respond more to vendor marketing than product quality, so they'll immediately be up against competitors' claims that "we can give you a device that ticks the same boxes on your scorecard as the iPad for $200." The underlying problem with "level playing fields" in this case is, of course, that most "customers" _never expect to use the adopted products themselves,_ hence the only meaningful difference between the iPad and "$200 feature-pad" is, well, about $300. In this environment, a small number of important exclusive titles could make all the difference, and, in this light, "mere" standards compliance is at least a short-term antifeature from Apple's point of view. The iBook format is NOT meant to be compatible with ePub3. Apple doesn't care if it is compatible with some standard. Apple only wants what is the best format for TODAY and for the iBookstore for its customers. Apple certainly allows ePub format eBooks in the iBookstore. But it wants a proprietary format for itself as an option for its customers. And it provides the tools for it for FREE. Apple gives you the option of standards compliant or proprietary format. It's your choice what to work with. Of course, proprietary format means it has more advanced features TODAY without having to wait for years for a standards body to haggle with each other to finally agree to standard. A proprietary format also means Apple can modify it with even more advanced features for the future. I would love if the iBook Author application can create eBook apps! Of course, these would never be compatible with other platforms. But I wouldn't care. Proprietary formats are MUCH MORE PROFITABLE than standard formats. Just look at the proprietary Kindle format. Amazon doesn't care if you complain about it being nonstandard. And certainly, Amazon's customers aren't complaining either. I don't quite get the criticism for them using extended underlining, template layouts, and the (rejected) proposal for allowing individual column widths and gaps if the CSS community has rejected them, or at least deferred consideration. (As we often find with software and requirements, if we say 'non' too many times, the requirement does not go away - and the customer may solve it in a way we don't like, or that doesn't fit our long term view. But it is hard to criticise them for doing so). Also unsure whether it may be better this is a proprietary format, rather than (as with canvas, and some of webkit CSS extensions) pushing 'proprietary' changes into browsers - and therefore into the standards as fait accompli. In this case, it is both acceptable and desirable for the format to be proprietary. Acceptable because this isn't the open web, this is a format designed for a proprietary app running on a closed device. Desirable because it allows designers to take variables such as screen size, resolution, and rendering implementation out of the equation - less variables means more creative energy to spend on making good content. The criticism is legitamite since Apple is pushing this for the textbook market. There's no way any educational institution - especially a public one - should accept a format that is only usable on Apple hardware. You say you will "vote with your feet"? You have never purchased an Apple product (based on your post this seems highly likely) so why would this be any different? Had Apple released this tool as ePub Author, would go out and buy a Mac to use it? Nope. Apple never claimed this tool was anything but a proprietary option and a proprietary format. Apple offers it free to entice creation of exclusive content for their hardware. Amazon sells the Fire at a loss to entice purchasing content from their site. Google gives away Android to entice people to view more of their ads. Why not? They did with Word and Office for years and years. "iBooks on my iPad is anemic" - true for me and the Kindle app provides a much better selection, service and the app is better than iBooks as well (of course that is reading Knlde format - not saying the same will hold for iBooks). But of course Kindle is also uses a proprietary format. So really if Apple want to make great software for authors to create books for Apple devices there is no problem as far as I can see. Apple have made the rules and you can choose to participate or not. @Steven it strikes me that 'M$ did it too' arguments are not very strong. Reminds me too much of the insecure underdog that Apple was, to be redeemed 'now our time has come!' Of course Apple is entitled to do so but please do not pretend 'it's because our education DNA'. Its not about money either. It's about power+influence. @Steve XCode can compile Android apps. It doesn't offer the same amount of integration as Eclipse but it can be done. Also the OS on the Kindle Fire is not a near fork, it's a fork. I am currently building up a documentation wiki for iBook Author and was wondering if I could use the information provided here regarding the file formats (with proper credit given to you of course). Despite the fact that I am doing the Wiki, I agree that iBook Author should have adhered to the official ePub3 standard in order to have compatible publishings. When I now see, what happens for publishing yet another "Modern Book" it reminds me very strongly of HyperCard and its history. Basically "iBooks Author" is taking the same approach. Make it "interactive" and add some "Widgets" and it is a programmable book programmers will like. It just simply debunks the myth we are talking about a book here. It is a software-application and nothing more and nothing less. It is not a book. It is some multimedia assembled content, which clearly misses a lot of the things which make a book a book. To conclude: This is a nice piece of remix of Pages & Keynote to create interactive iPad presentations, with completely unsure future of support. Nothing that even comes close to the product-quality of ANY book out there based on dead tree media. So basically Apple is providing a free tool, and the author essentially works for Apple for no salary. So why is everyone so against SOPA, but not walled education? Apple is forcing us to choose convenience over freedom, when there is no reason to do that! Thanks for the interesting post!. We are taking care about how Apple is now the new Microsoft (like) and we hopefully people realize that Apple is nothing more than a company and what you really want is your money, leaving the issue aside from being a fanboy. We have made a mention in our blog (in Spanish) for your interesting article. That's all, then why not some proprietary formats if the works using them can be bought in the same environment. And as a content buyer/reader/user what you don't want is a special bookshelf, shop, or machine for a given format, as to the format, if the thing works, who cares ? I very much agree – with Glazou’s article that is, not the fanboys’ comments. Regarding the EULA, though, I read it as disallowing to sell proprietary .ibook (or .iba) files elsewhere – and they are readable on i-pads only anyway –, but after conversion to .epub, .pdf or some other format it’s just fine to offer them in any ebook store there is.